The ''Feast of the Gods," as we see it today, in X-ray, and in infrared. Around 1512, Alfonso d'Este, Duke of Ferrara, commissioned Giovanni Bellini to paint this masterpiece of the Italian Renaissance, the Feast of the Gods. (This is the first time this painting has been exhibited in Spain.) It was painted to hang in the Duke’s Camerino d'Alabastro (his private study and treasure chamber). The overall decoration of the Camerino d'Alabastro was given to the court painter, Dosso Dossi, and in 1522, Dosso painted over half of Bellini’s canvas. Seven years later, Titian painted over the Feast of the Gods a second time. Thus, in this unique painting, we see the hand of three different painters. What did the earlier versions look like? How much of each artist’s work do we see today? What motivated these unprecedented changes? For centuries these questions remained unanswered. In the last Fifty years, new scientific techniques have enabled specialists at the National Gallery of Art to obtain X-ray, infrared and cross-section data. This information has proved crucial in dispelling the mystery surrounding this painting. The painting’s past has now been revealed. In the 1950’s, researchers at the National Gallery of Art in Washington, DC first took X-ray photographs of the Feast of the Gods. They discovered another picture beneath the surface of the painting. Beneath Titian’s landscape, which we see today, they also found Bellini’s original landscape. 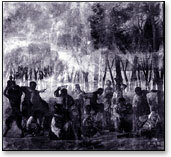 The X-ray photograph is shown below right. 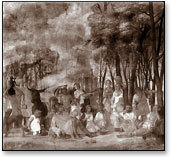 Looking closely at the X-ray, we see a new frieze of trees stretching from left to right across the painting. Whose painted these trees? Why were they removed? 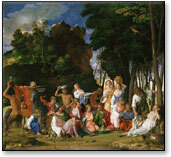 What did Titian keep and what did he repaint? We will explore the X-ray, and other evidence at length in this online section. This page provided by WebExhibits. See credits.